Grandma Moses was one of America's best-known primitive painters (artists who did not receive a formal art education). the third of ten children born to Russell King Robertson, a farmer, and Margaret Shannahan. She had a happy childhood and worked hard on their family farm. Her father enjoyed seeing the children's drawings and would buy them large sheets of blank newspaper upon which they could draw. The young Anna Mary loved to draw happy, colorful scenes. She only attended school in the summer due to the cold and her lack of warm clothing. At twelve she began earning her living as a hired girl at homes near the family farm. In 1887 Anna Mary married a farm worker, Thomas S. Moses, and the couple settled on a farm in Virginia. They had ten children, five of whom died at birth. In 1907 the family moved to Eagle Bridge, New York, where Grandma Moses spent the rest of her life. It was on this farm in Eagle Ridge that Anna Mary painted her first painting. She was wallpapering her parlor and ran out of paper. To finish the room she put up white paper and painted a scene. It is known as the Fireboard, and it hangs today in the Bennington Museum in Bennington, Vermont. Her husband died in 1927, and her son and daughter-in-law took over the farm. As she aged and found farm work too difficult, Grandma Moses took up embroidering pictures in yarn to fill her spare time. At the age of seventy-six, because of arthritis, she gave up embroidery and began to paint. Her early work was usually based on scenes she found in illustrated books and on Currier and Ives prints (prints made during the 1800s, showing American lives, historical events, and celebrities). In 1938 Grandma Moses's paintings were discovered by an art collector and engineer, Louis Caldor. He saw a few of her paintings displayed in the window of a drug store in Hoosick Falls, New York, while on vacation. He purchased these, and the next day he bought all the paintings Grandma Moses had at her farm. In October of 1939, three of these paintings were exhibited at the "Contemporary Unknown Painters" show at New York's Museum of Modern Art. Her first one-woman show was held in New York City in 1940 and immediately she became famous. Her second one-woman show, also in New York City, came two years later. By 1943 there was an overwhelming demand for her pictures, partially because her homespun, country scenes brought about wonderful feelings and memories for many people. Most of Grandma Moses's paintings were done on pieces of strong cardboard, 24 by 30 inches or less. She regularly portrayed happy scenes of rural home life, sometimes picturing herself as a child. She also painted a number of historical pictures, usually about her ancestors, one of whom built the first wagon to run on the Cambridge Pike. In some works figures are dressed in eighteenth-century costumes, as people might have dressed in the country. Certain color schemes correspond to the various seasons: white for winter, light green for spring, deep green for summer, and brown for autumn. Among her most popular paintings are The Old Oaken Bucket, Over the River to Grandma's House, Sugaring Off, and Catching the Turkey. Grandma Moses worked from memory, portraying a way of life she knew from experience. The people in her paintings are actively engaged in farm tasks, and, although separated, are part of the established order of seasonal patterns. In most paintings the landscape is shown as a large, scenic view and would be completed before the tiny figures were put in. 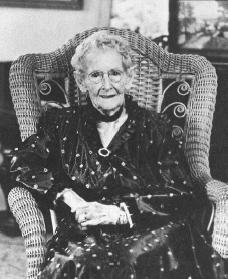 Grandma Moses died on December 13, 1961. Technically the work of primitive painters is distinguished by a conceptual (a general and broad view) rather than a visual or realistic and accurate approach to painting. This involves an innocent picture using a linear format (flat, one dimensional space) that portrays scenes and people with an absence of weather in the skies and shadows around shapes. Some of the strengths of primitive painting lie in the feeling for pattern that is painted into the picture and the charm of the mood that is projected from the work. In Grandma Moses's paintings the viewer often feels the joy of life illustrated in the scenes. In McDonnel's Farm (1943), for example, a group of children are shown in a circular dance at the right, while all the other figures are busily engaged in farm tasks: one man loads the hay wagon, another harvests, another cuts the grass with a hooked tool called a scythe. In her paintings there is no despair, unhappiness, or aging, yet this unrealistic view of life is presented with remarkable power. Biracree, Tom. Grandma Moses. New York: Chelsea House, 1989. Kallir, Jane. Grandma Moses in the 21st Century. Alexandria, VA: Art Services International, 2001. Kallir, Otto, ed. Grandma Moses: American Primitive. New York: H. N. Abrams, 1975. Ketchum, William C., Jr. Grandma Moses: An American Original. New York: Smithmark, 1996. Moses, Grandma. My Life's History. Edited by Otto Kallier. New York: Harper, 1952. Thank you for this useful article. I enjoy 'getting to know' artists who are long gone and, when suitable, attempt to sketch them. With each one is a summary of their life and work. Having read Otto Kallir's book, Grandma Moses I was pleased to find this information which confirms what I have read. OMG that was so cool, i liked reading about this person this was great! Who is Bonnie Lee Forest Bennett? Is she related to Grandma Moses? Im doing a report on Grandma Moses and I found this biography really useful. Thanks! Im doing an english report on Grandma Moses and this is really helpful! i have 2 do a time line and hve 12 things on it! this REALLY REALLY helps! thanks! I am learning to paint at age 65. Others at my seniors class joke about being a Grandma Moses so this information about who she really was was very informative for me. Can you tell me who her siblings are? Can you tell me the names of her children (the 5 that lived)?